Preheat oven to 400°F (204°C). Line a large baking sheet with parchment paper or a silicone baking mat. Set aside. Place the bite-sized pieces of chicken in a large bowl. Add flour and stir to coat each piece. Set aside. Place the corn flakes, salt, pepper, garlic powder, and smoked paprika into a large bowl. Set aside. Whisk the eggs and milk together in a small bowl. This next step gets your hands a little messy so have paper towels nearby. Dip each piece of chicken in the egg mixture, letting any excess drip off. Then generously roll in the cornflake mixture, shaking off any excess. Place onto the prepared baking sheet. Repeat with all chicken bites. Bake for 18 minutes, flipping once at the 9-10 minute mark. (During this time, I make the sauce in step 6.) Remove from the oven and allow to cool for 5 minutes. Heat the sauce ingredients in a small saucepan over medium heat for 6-7 minutes, whisking occasionally. Carefully place the chicken bites into a large bowl. Pour the warm honey BBQ sauce on top and gently stir to coat. Serve warm. Leftovers keep well in the refrigerator for up to 1 week. Reheat in the microwave until warmed through. Make ahead tip: Prepare the popcorn chicken through step 4. Refrigerate for up to 1 day before continuing with step 5. You can also freeze the baked popcorn chicken before tossing in the honey BBQ sauce. Bake frozen popcorn chicken in a 350°F (177°C) oven for 20 minutes or until warmed through. You can leave the popcorn chicken plain. 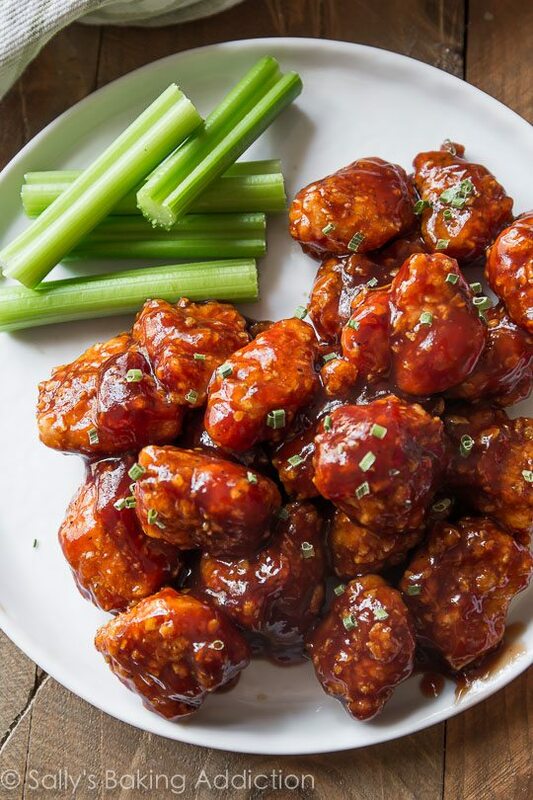 Simply add a little more seasoning (salt, pepper, smoked paprika, and garlic powder) to the cornflake mixture and leave off the honey BBQ sauce.